Bob Dylan’s TELL TALE SIGNS: The Bootleg Series Vol. 8 – the 8th installment in the best-selling and critically lauded Bootleg Series which launched in 1991 - was released by Columbia Records in October 2008. 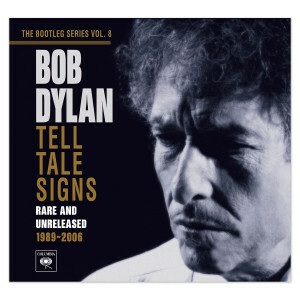 A treasure-trove of 27 songs spanning two discs, TELL TALE SIGNS features previously unreleased recordings and alternate versions of tracks from sessions which generated some of Bob Dylan’s most acclaimed and commercially successful albums from the last two decades, including Time Out Of Mind, Modern Times, Love and Theft and Oh Mercy.